How To Find A Missing Cat and Save Your Marriage in Haruki Murakami's "The Wind-Up Bird Chronicle"
What would you do when your cat is missing? If your husband is unemployed, that is his job. How do I find this answer? My friend Ronald Susilo tells me *LOL. This is his newest note about Haruki Murakami's novel "The Wind-Up Bird Chronicle". Why Murakami chooses this unusual title? Ronald gives you the answer. Check it out! This is the eighth novel from Haruki Murakami I have read in 2017. The way he chooses the theme or the topic of the novel and takes a point of view from all the characters he creates makes me deeply understand Haruki’s way of writing. The common sense, if you “fall in love” with a novel that you have read it in the first time, it is a physiology of reading behavior. But if you still read it for another tittle from the same author, this is an extraordinary behavior. Isn’t it? I know that the story from Haruki will not brings us to step from one side to another side or from one tragedy to another. But, most of his story doesn’t go anywhere. Just stay calm with the very steadily situation of story. The other story—I think a little part of his story—can brings our imagination wildly and makes us forget about the real story that we read. This is my opinion after read Murakami in eight novels. The story in this thick novel (about 600 pages) is about simple little thing daily problems: missing cat. Yes, only about a cat. Toru Okada as a protagonist is asked by his wife, Kumiko, to find out their missing cat. How can his wife asked his husband to find the missing cat? Because Toru Okada is unemployed man, does not have any job at all, stay all time at home, alive and healthy. For that situation, his wife tries to find a reason to force Toru get a job. Find a missing cat. In the same time, Kumiko, Toru Okada’s wife, goes to other man. From this section of the story, I get enough unclear logical thinking. Is because Toru is unemployed and Kumiko find another man? Or, is because the cat is missing so Kumiko leave Toru Okada? Or, is it because of unemployed and missing the cat Kumiko find another man? I can’t answer these questions. This is the style of Murakami. Makes a story seams relevant and flow smoothly but illogically. Is this style of surrealism? Still talking about a missing cat. Toru Okada still can not find a cat. He has been unsuccessful. So, the last action is to consult this problem with soothsayer or a shaman. Toru and Kumiko are believing in fortune-telling and other clairvoyant-like skills. They ask Malta and Creta Kano (a psychic) to find out a missing cat by using vague insight of the future. This situation makes a thing more complex. Are the people with no jobs (unemployed) always believe in soothsayer or shaman? Is soothsayer or shaman will exactly tell the answer or this will waste our time? Murakami only gives an answer by the end of this novel: after about one year, the cat come to Toru Okada. Simple answer but still leave a lot of questions in my head. Divorce or breaking a relationship with the one we love will makes us stress even depress. The unique way to express this situation, Murakami makes Toru Okada uses well as a hiding place. I think, the well is very deep symbols of misery. Murakami is excellent in that. So, if we have a big problem we can use a bottom of the well to calm our self and to think through the situation. After I read novel by novel, I conclude that Murakami’s novel is full of characters with a very ordinary men or women as a hero, a passive and confusing person and affectless, low expectations, lack of ambitions. In this novel, the story is about Toru Okada—a man whose life is without direction. The title of every novel by Murakami is unpredictable and use uncommon words that does not describe entire story. 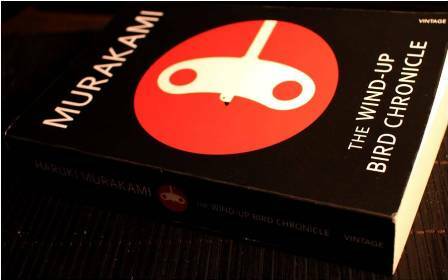 Like this novel, the wind-up bird chronicle is taken from the bird that create by Murakami with no particular reason of connectivity with all of background of the story. Baca juga: Haruki Murakami and Words We Don't Know on His "Norwegian Wood"
I must think again and again, re-read regularly and think of it deeply but the answer still not come in my mind how this title connects with all aspect of this novel. The more trying to related it the more far from the answer. So, I decided not to think about it seriously just feel and enjoyed it. Even that is a symbol of evil or not I don’t care it. This is my rights to enjoy the reading process. Ps: M. Ronald Susilo is a doctor. Also a great book lover. Lives in Ruteng, a small city in west Flores, a city where you can find Kompiang and a very right coffeee and rain. Wah, senang dapat perspektif ini. Terima kasih sudah mengunjungi ranalino.id. Tabe.